The Naginata, famed weapon of the Sohei, or warrior monks, of medieval Japan was fearsome in the hands of a skilled combatant and is today of great importance in the martial arts field. Our Naginata, while retaining its traditional qualities, has now been revised to better meet the needs of the martial arts practitioner. Mounted on a long tang to better absorb the shock of a blow, the blade has a strong distal taper for balance and quickness. 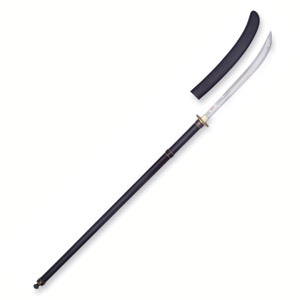 The Naginata is supplied with a wooden saya, a protective cloth bag and a traditional boxed maintenance kit. 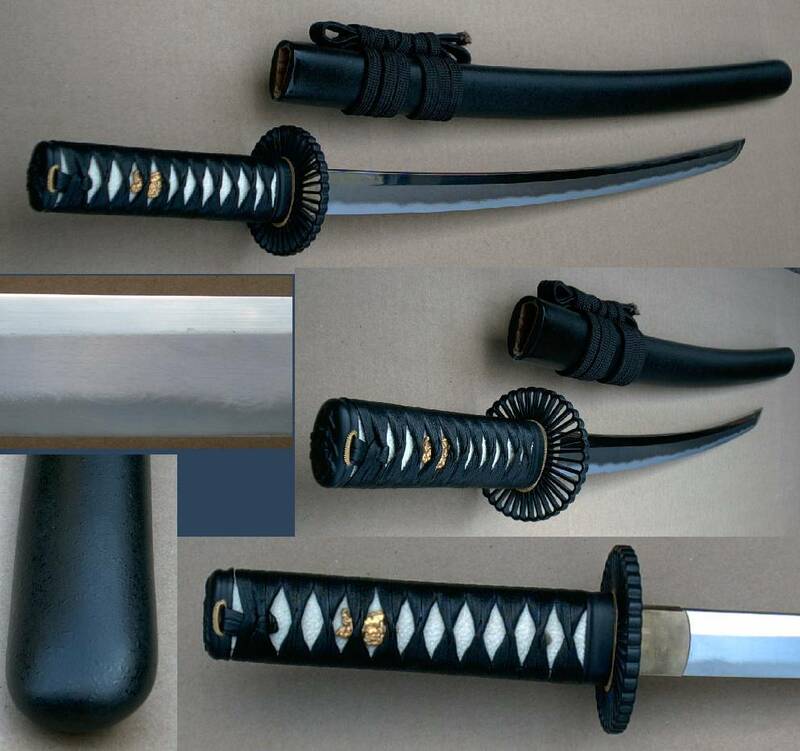 Each piece in the Bushido group has a hand-forged and folded ASSAB-K120C powder steel blade, differentially tempered to produce an HRC60 edge, HRC40 back and a distinctive hamon. Saya are deeply lacquered in old gold with inlaid brass sakura flowers. Quality ray skin is used on the tsuka of the Katana and Wakizashi, while the tsuka of the Tanto is of gold-plated brass with a battle-scene decoration in relief. 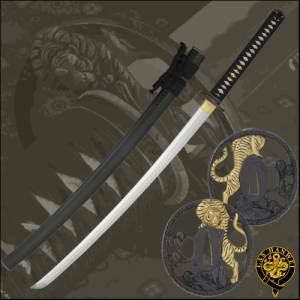 The tsuba of the Katana and Wakizashi is of blackened and bronzed iron, with detailing in gold and silver and a battle scene decoration. 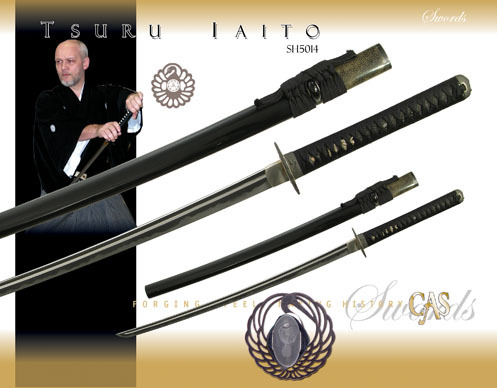 The tsuka-ito on the Katana and Wakizashi and the sageo on all three pieces are woven from Japanese cotton. The fuchi and kashira are of blackened bronze with brass detailing, and the kojira, koiguchi and kurigata are of polished horn. The habaki is brass. The Katana and Wakizashi blades are ungrooved, while the Tanto blade is grooved on both sides. 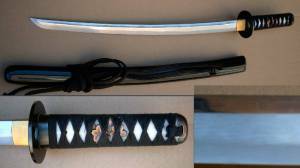 The Katana and Wakizashi have medium length Kissaki. 27.75" Overall with a 19 7/8" sharpened, edge tempered, high carbon steel blade . 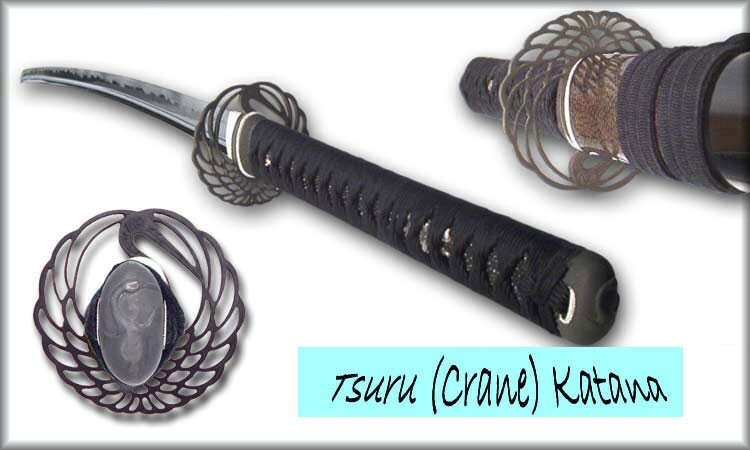 Genuine rayskin handle with a wrap (Tsuka-Ito) specially developed for its gripping qualities. Black finish 'sunburst' design iron tsuba. 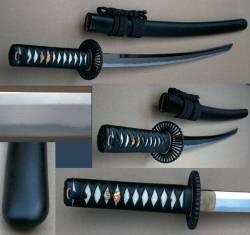 Black finish wooden scabbard. The Meijin Iaito (SH5018) is an amazing testament of the quality produced by CAS/Hanwei. The blade is forged-folded T10 high-carbon steel with grooves (bo-hi) on both sides of the blade, which allows for a lighter blade and audible feedback when swung. The blade is differentially tempered using a traditional claying method and has a beautiful grain pattern (hada) with visible layers. The tsuka is wrapped in genuine ray skin (same) and the tsuka-ito is premium black Japanese cotton. The black iron square tsuba, fuchi, & kashira are done in a �Turbulent Ocean" motif. The habaki is a one-piece brass construction. The saya is done in a beautiful black matte striped finish going the whole length of the scabbard and the sageo is black cotton. 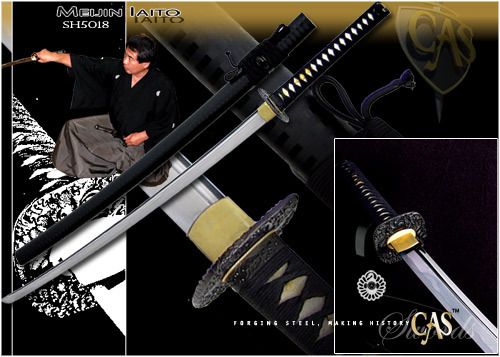 The Meijin Iaito represents the pinnacle of production quality for Iaito swords. Traditional crane tsuba with matching fuchi and kashira. Black ray skin with genuine black silk wrapped handle. The sheath is part bound in ray skin and the sword is finished with silver fittings. 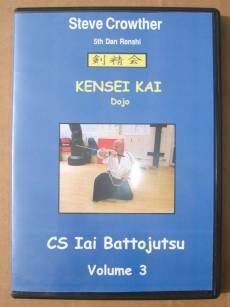 Continuing on from volume 2 in the traditional styles of Japanese Sword Arts, this DVD teaches kata 5 through 9. The Tiger Elite Katana has been re-designed from kissaki to kashira. Utilizing a hand forged and folded Performance Series katana blade and some of the finest fittings available, the Tiger is equally at home as a cutting blade or showpiece. The K120C powder steel blade is differentially hardened using the traditional claying method which produces a HRC60 edge and HRC40 back. This allows for superior edge holding and cutting ability while allowing the blade to absorb the shock of a blow. The hamon (temper line) and hada (folding pattern) are very prominent. 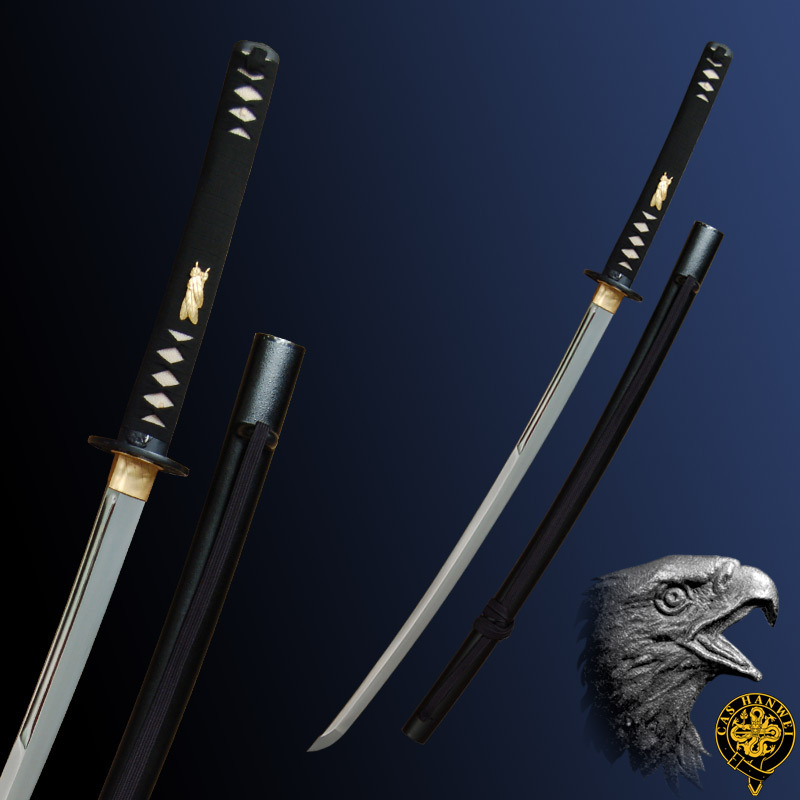 The koshirae (fittings) are all made from blackened bronze and detailed in gold. The tsuba (guard) is made from blackened iron with a stalking tiger motif. The same is of the finest ray skin while the tsuka-ito (handle wrap) and sageo (scabbard cord) are made from top-quality japanese cotton. The Tiger is supplied with a protective cloth bag and traditional maintenance kit. The Raptor Unokubi-Zukuri (Cormorants Neck) blade design is patterned after the shape of the Naginata, the powerful long-handled weapon popular between the 12th and 14th centuries. Notable for the strongly relieved shinogi-ji and diamond-shaped kissaki, the Unokubi-Zukuri provides excellent balance in a strong cutting blade.